The Acer Chromebook Tab 10 is the world's first Chrome OS powered tablet. The slate was first announced in March, with a commercial release in North America expected as early as April. After a few unfortunate delays, the Chromebook Tab 10 is finally widely available to US consumers. The tablet is expected to be priced at around $330, but can be found anywhere between $337 and $462 across various authorized resellers. NewEgg appears to be offering the best deal on the Chromebook Tab 10 with their $329.99 price. 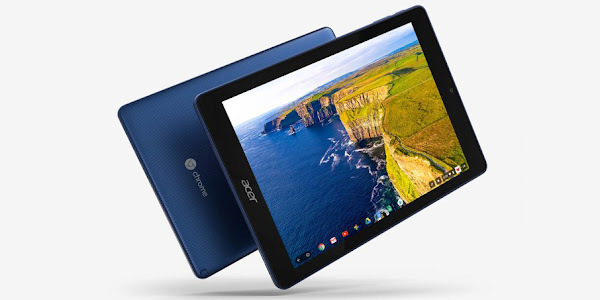 The Acer Chromebook Tab 10 features a 9.7 inch 2048 x 1536 QXGA display, 32GB of internal storage and is powered by a 2GHz hexa-core Rockchip RK3399 processor with 4GB of RAM. The tablet is capable of 9 hours of use between charges thanks to this setup and should be for the daily multi-tasking needs for a student. Acer has also included a Wacom EMR stylus boasting “natural” writing and drawing capabilities.